Outdoor cats typically shed twice throughout the year; once in spring and then again in autumn to make room for their thick winter undercoats to come through. Because the shedding cycle is affected by daylight hours, indoor cats have slightly confused cycles and tend to shed continually throughout the year. For this reason, it is important to groom your cat regularly, especially in autumn when shedding is likely to be a bit heavier. They might not be prone to as many skin complaints as dogs during winter, but they do still suffer with dropping temperatures (or rising, if your cat is a house cat), increased wind and rain, and seasonal allergies. Groom daily – when hair sheds, it is vital we remove it on a regular basis to keep our furniture and floors fuzz-free. It also stops our cats from grooming it away themselves and then bringing up hairballs. Removing loose hair through regular grooming is also necessary for the health of the coat, as it aids the hair renewal process, stimulates the hair follicle to secrete its natural, protective oils, and encourages better blood flow. Regular grooming also removes dandruff and debris that might have been picked up outside, and helps you to spot parasites and problems with the skin early on. Turn the heating down a notch – in October many of us start to think about turning our heating on. But this can be very drying for the skin and can make cats uncomfortable, especially if they are longhaired and live exclusively indoors. When the heating goes on, fleas can hatch in the carpets and furnishings of your home, so you may notice that your cat is itching and scratching more than usual. If you notice a sudden infestation, wash all of your blankets and bedding, use a household flea spray such as Indorex, and treat your cat with a targeted spot-on like Fipnil or Frontline. Keep your cat hydrated – when it’s not boiling hot outside, it’s easy to forget that your cat still needs to drink water throughout the day. A dehydrated cat is going to run into problems, especially when it comes to the health of its skin and coat. Remember to have fresh water on offer all the time and be extra mindful when the heating is on or you have a fire going. 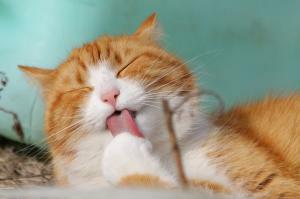 Add a supplement – your cat’s diet is vital to its skin and coat. Omega 3 and 6 are essential fatty acids that nourish the skin and act as natural moisturisers to deliver a healthy glow. If your cat’s coat seems dull, dry or lacklustre, think about including a fish oil supplement like Yumega to your cat’s diet.